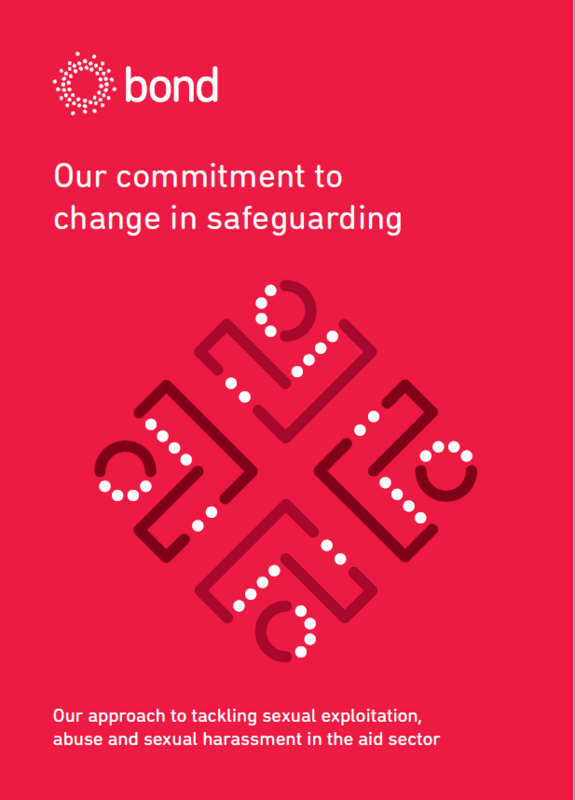 As part of our commitment to change in safeguarding, we have been working across the sector to drive forward better practice and standards. Over the last seven months, four working groups have collaborated on a series of projects and commissioned guidance and tools to improve safeguarding practices across these themes. Get more information and details on our projects and progress below. If you’re a Bond member, you can also view draft versions of these outputs in our members’ area, including information on next steps and further consultation. NGOs cannot achieve change through policies and procedures alone: leaders need to deliver a bold and generational shift in culture within individual organisations and collaboratively across the sector. This means recognising and systematically challenging sexism, gender inequality and other power imbalances including age, race, disability, faith, sexual orientation and gender identity. The sector needs to establish a shared set of guidelines and standards for organisational cultures rooted in safeguarding, which leaders can sign up to and adhere to. See draft leadership commitments in our members’ area. A working group has collaborated with government and key agencies to develop improved background checks globally and within the UK. The group has also supported the development of an inter-agency scheme for the disclosure of safeguarding-related misconduct in recruitment processes within the humanitarian and development sector. Read more about the inter-agency scheme in our members’ area. A set of definitions, mapping key definitions and terminology in relation to “sexual exploitation, abuse and harassment” and “safeguarding”. A toolkit of essential elements of a reporting mechanism. This includes flowcharts to clarify the different mechanisms that organisations should use to receive, process and respond to safeguarding complaints quickly and effectively. Four case studies to illustrate how elements and principles of robust reporting mechanisms would apply to real-life scenarios. The case studies will identify key actions, recommendations and selected questions for further consideration. See draft versions of the above in our members’ area. A review of charities’ annual reports found that very few mentioned safeguarding and that there was little consistency in their approaches to reporting to the public and to regulators, like the Charity Commission. We are reviewing existing practice and developing proposals and guidance to help NGOs report transparently on aspects of sexual exploitation and abuse. The guidance will set out a minimum reporting threshold for organisations and suggests how reporting should be undertaken annually. It will not be prescriptive about where reports should be made or in what form. Charities may choose whether they report in their annual report and accounts, in a separate accountability report, on their website or elsewhere. A draft guidance and details of consultation will be shared shortly in our members’ area. The Charity Commission for England and Wales states the duties of trustees include taking reasonable steps to protect those connected with the charity from harm. Trustees of UK NGOs are grappling with how to ensure that they fulfil their duties in relation to safeguarding. We have developed a good practice guide for trustees on safeguarding. This guidance is intended for the boards of international NGOs registered as charities in the UK. This good practice guide supplements the Charity Governance Code on the specific area of safeguarding governance for UK NGOs. Supplementary guidance is also being developed, to help trustees with implementation and good practice examples. Access the safeguarding space in our members’ area to view draft versions of these outputs, and information on next steps and further consultation. This bespoke workshop equips boards of trustees to meet their responsibilities for safeguarding. Delivered in-house for your organisation. This practical, one-day course gives you a thorough grounding in a range of participatory monitoring, evaluation, accountability and learning (MEAL) methods, tools and approaches. This interactive, facilitated online course prepares you to develop a quality theory of change for your programme or organisation which meets industry-recognised quality standards as well as donors requirements.